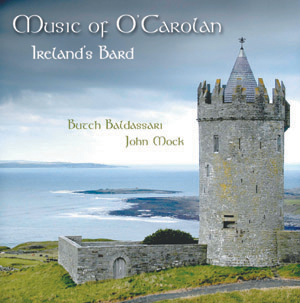 Butch Baldassari and John Mock have joined forces once again, turning in a collaborative effort on the extensive catalog of Irish harpist/composer Turlough O'Carolan (1670-1737). These 10 tracks provide 20 tunes that cast some new light on the primitive elegance of O'Carolan's folky chamber music. This is the second CD for Butch and John. Their first duets CD was "Cantabile: Duets for Mandolin and Guitar." Released in 1998, Cantibile was was a hit with both critics and fans. You can find it here under the All Products link.